Looking to fill up your iPhone or iPad with free apps? Great apps go free on a regular basis, just like these 29 apps. 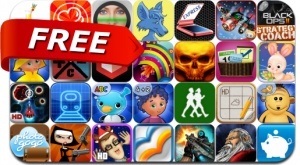 This apps gone free alert includes ElectroTrains, Nun Attack, Retro Dust, Bombshells: Hell's Belles, Death Dome, SquareDiary, Photo Studio Express, Foxit Mobile PDF, Augment and many others. i Learn With Poko: Seasons and Weather! i Learn With Poko: Fun Counting and Addition! i Learn With the Mighty Jungle: Animals! i Learn With Boing: Ice Land Adventures!